Gail Jenkins was a dynamic teacher and long-time HAPS member. Gail loved teaching. Most of all, she loved to make difficult concepts in anatomy and physiology easily comprehensible to her students. To accomplish this, she employed the “Keep is simple, Sweetie” (KISS) approach. When facing a difficult concept, she’d urge her students to “KISS” it by using everyday analogies or tools to visualize and simplify the subject. Her students loved this approach. Is willing to mentor other instructors in this approach. The award includes a $1000 cash award and waiver of the 2018 Annual Conference registration fee. Award recipients will present a workshop during the workshop sessions at the annual conference. To qualify for the award, applicants must be HAPS members engaged in teaching anatomy and physiology, must provide an explanation of how engaging learning activities are incorporated into their classes, must provide an abstract of a workshop to be presented at the 2018 conference, and must provide a letter of recommendation from a colleague with direct knowledge of the applicant’s teaching and student interaction. Applicants who can demonstrate a spirit of sharing this approach and mentoring their colleagues will be given preference. HAPS expresses its thanks to Wiley Publishing for support in the establishment and continuation of this award. Applications can be found on the HAPS website. The application deadline is December 1st. HAPS Offers Grants and Scholarships! In 1994 the HAPS Executive Committee initiated a program of modest grants, scholarships, and awards for anatomy and/or physiology faculty and their students. These awards support the mission statement of the Society, which is to promote excellence in the teaching of human anatomy and physiology. Applications for all grants, scholarships, and awards must be submitted online. Links to online applications, eligibility, and additional information can be found on each grant-specific webpage. The submission deadline for all the scholarships listed below is December 1, 2017. Some of the applications require letters of recommendation, so now is a great time to check them out. Click on a grant or scholarship to see if you qualify! HAPS-Thieme Excellence in Teaching Award: To recognize and reward excellence in undergraduate A&P instruction. Award winners will be nominated by colleagues and will demonstrate the core values of HAPS. Gail Jenkins Teaching and Mentoring Award: This is an annual award for a HAPS member who demonstrates use of engaging learning activities to help students truly understand and retain the more difficult Anatomy and Physiology concepts with kinesthetic and active learning strategies using inexpensive everyday props. The award is also designed to recognize those willing to mentor other instructors to also incorporate active learning to benefit more students. The ADInstruments Sam Drogo Technology in the Classroom Award: For the innovative use of technology to engage undergraduates in human anatomy and physiology. Three awards are available, all is sponsored by ADInstruments, but use of ADInstruments equipment or software is not required. Robert Anthony Scholarship for New Instructors in A&P: To encourage faculty during their first five (5) years of teaching anatomy and physiology to network with seasoned professionals by attending the HAPS Annual Conference. HAPS Graduate Student/Post Doctoral Travel Award: For graduate students or postdoctoral students to attend and present a poster or workshop at the HAPS Annual Conference. The deadline to submit your application for any of the above scholarships is December 1st. So go on and get started! The President’s medal is an award that recognizes a HAPS member who has provided exemplary service to HAPS. The recipient of the award is chosen by the current HAPS President and is announced at the Annual General Membership Meeting. Terry Thompson explains below why she chose Carol Veil as the 2017 President’s Medal recipient. I had the pleasure of presenting this year’s medal to Carol Veil in Salt Lake City. Because the choice is kept secret, I first shared a “hint” with the audience in the form of a special chocolate Oscar-like statue. I think most everyone in the room got the hint, except Carol. In true humility, as she was dutifully taking minutes from the Annual Membership meeting, Carol looked up and thought, “Gee, there must be someone else here that likes chocolate as much as I do”. Carol served on the Steering Committee as chair of the Curriculum & Instruction Committee from 2005 to 2009. During that time she coordinated 35 faculty from 18 different states to develop the HAPS Anatomy & Physiology Learning Outcomes, which continues to be one of our organization’s most valuable members resources. The Learning Outcomes are used by faculty to develop and assess their courses, by publishers to organize textbooks, and by the HAPS Testing Committee to write questions for the HAPS Exam. The coordination and organization of this major project is even more amazing when we think back to the limited technology that was available at that time for collaboration only by email attachments and multiple versions of documents. In her 19 years as a HAPS member, Carol has given individual and team workshops at 20 annual conferences and at 5 regional conferences, often presenting some of both at the same conference. Many of us have gleaned new teaching tips and strategies from the various workshops presented in partnership with Javni Mody, such as the popular Awesome Analogies or Mnifty Mnemonics, as well as learned so much about the physiology of chocoholics from a connoisseur. She also served on conference planning committees for the 2009 Baltimore Annual conference and two regional conferences. Carol also involved her students in the pilot study for the A&P 1 only version of the HAPS Exam. Most recently, Carol was elected to the Board of Directors as Secretary for two terms since 2013, serving with four HAPS presidents. As a result, she played a role in the initial development and the mid-term review of the HAPS 2014 – 2019 Strategic Plan that provides the great vision and process to lead HAPS successfully into the future. Carol was chosen for this award based on her work in these many roles as she ends her term as HAPS secretary and retires from Anne Arundel Community College (AACC) near Annapolis, MD. She has already committed to continuing her involvement with HAPS with initial plans for a team workshop in Columbus OH and agreeing to serve as Chair-in-Training under Don Kelly as the next co-chair of the Foundation Oversight committee for Grants and Scholarships. 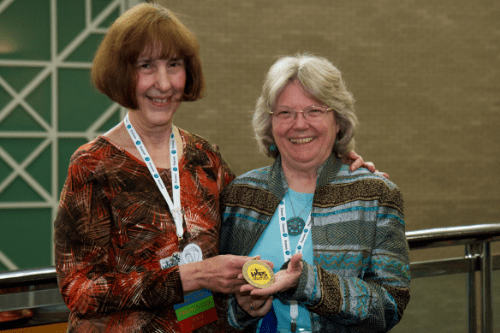 It was my honor to present Carol with this well-deserved recognition and we all look forward to her continued HAPS contributions as a retired emerita member.